I have a few confessions to make… I hate the taste of water; the only fluids I’ll willing consume are tea, gin and custard. I never manage my five-a-day (or is it seven-a-day now?) and often have cake for breakfast. And, worst of all, I am a picker; spots, blackheads, random lumps that appear on my forehead, all feel the force of my two forefingers. All things considered, I should be prone to spots, blemishes and wrinkles. Though I have my genes to thank for my relatively clear skin, I have developed a skincare routine that helps keep break-outs at bay, as well as one for when that monster zit appears on the very tip of my nose. I have been using these make-up removal wipes for as long as I can remember. My skin is highly sensitive to strong perfumes (even Johnson’s Baby Moisturiser stings 😦 ), but these wipes have never caused any irritation. Simple’s wipes are produced with different formulas, each tailored to different skin types – Cleansing, Exfoliating, Oil Balancing, etc. – I use Cleansing because I prefer full-coverage foundations and concealers that need an equally thorough removal. The only one I would not recommend is the Exfoliating wipes as their course texture can leave your skin feeling a little raw. The amount of eye make-up I wear means that I have to be careful not to scrub away at my eyes too much when removing mascara and eyeliner. This remover is excellent for lifting off those last bits of glitter, crusted eyeliner (eww) and waterproof mascara. As it is oil based, those with particularly oily skin may not take to this product, however, I would recommend it for anyone with dry or combination skin as it both cleanses and moisturises that delicate skin around the eye. 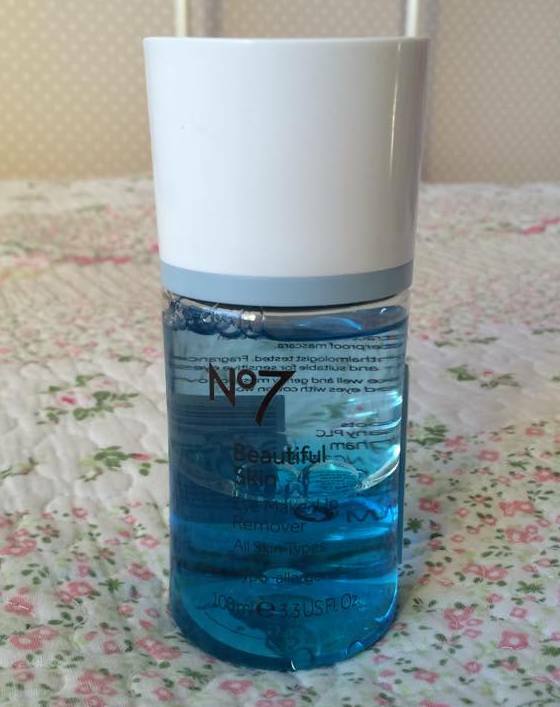 Boots No7 is a brand I completely trust when it comes to taking care of my skin. Their products are hypo-allergenic and ph-balanced so as not to cause irritation. As well as having a beautifully silky texture, they also have enough power to sink deeply into the skin, leaving it feeling fresh and hydrated. I know it’s kind of gross but this picture is of the cotton wool pad I use to cleanse my face. This is AFTER using a make-up wipe. Though make up wipes will remove make-up on the surface of the skin, cleansers penetrate deeper into the pores, helping to lift out the residue inside. Obviously cleansing is crucially important, but why use a toner? Many people skip this process, but toning is essential for restoring the ph balance of your skin. When I was younger my mom told me that while cleansers open your pores, toners close them; I don’t have the dermatological evidence to back this up, but it does enforce the equal importance of cleansing and toning (ideally twice a day). 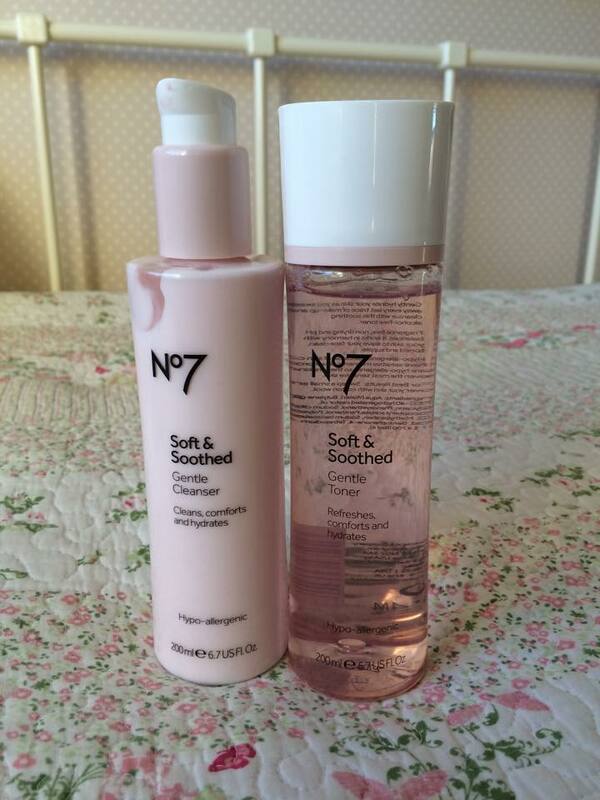 My favourite moisturiser is also No7, I review it here. In this col d weather, my skin can often look red and mottled. To solve this issue I use this colour calming primer, again by No7. The lotion is green – opposite to red on the colour wheel – meaning, once blended, it is particularly effective at reducing redness and helps to even out your complexion (as you can see from the picture below). When I do have break-outs, I often apply this to the area using a concealer brush, working it around the spot to mute that angry red colour. The key to this product is blending: a little goes a long way and, without effective blending, can leave your skin with a peculiar green-grey undertone. 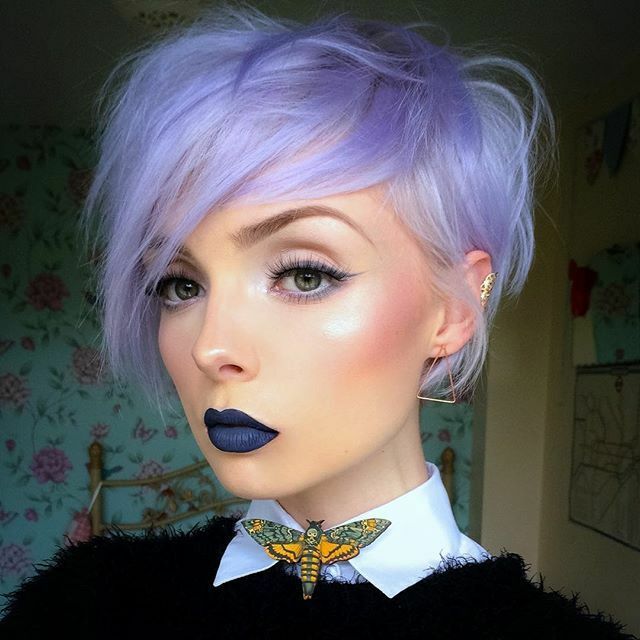 Once foundation and concealer is applied, however, the green colour is not at all noticeable. What products are key to your skincare routine? I love those Simple wipes. They’ve replaced the Neutrogena ones for me. Love that you’ve chosen relatively gentle products. My skin is somewhat dry and sensitive so these are things I could actually use. Your skin looks gorgeous. 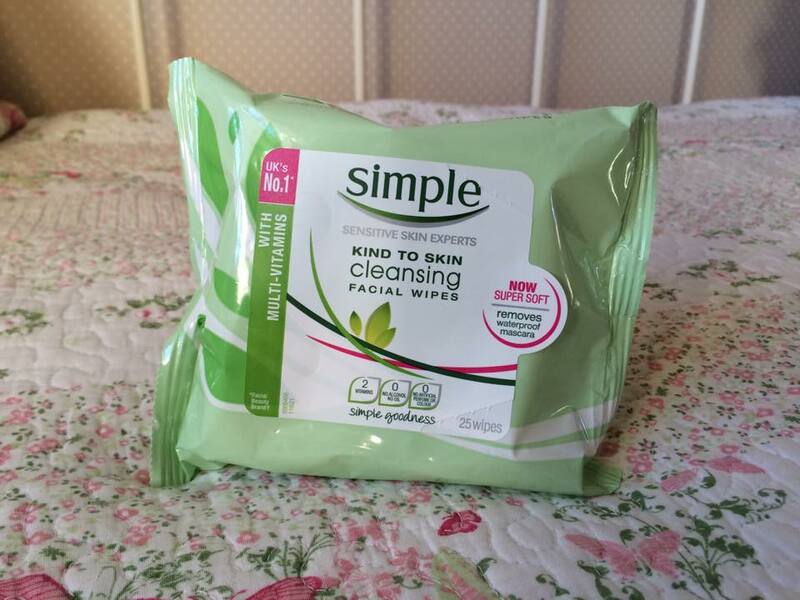 I think the simple wipes even irritate my skin, I was hoping they wouldn’t! Do you know of any others that are good for sensitive skin? I’ve used neutropenia before & they irritated my skin too. Perhaps try Clean and Clear Truly Gentle wipes? Clearsil might also be a good brand to use as both are aimed at clearing and preventing blemishes. But then again, so are Simple wipes. It might be a case of trial and error as to which one works best for you. If you don’t have any luck with wipes it might be that the process of scrubbing at your face with a cloth is the issue. In that case, it might be useful to try a cleansing lotion or face wash. These tend to be gentler on the skin (if a little drying so use plenty of moisturiser) because you don’t have to work it into your skin. Boots No7 do a ‘Melting Gel Cleanser’ which transforms into an oil when applied to the face, gently dissolving make-up. There are quite a few cleansing waters and cleansing oils on the market that may do the trick! Sorry for the lengthy comment, but I hope this helps! No, good ideas! Unfortunately, both clearasil and clean and clear are horrible for sensitive skin. After using either brands, my face gets tight & I develop painful, throbbing welts that last for several days! I think it could be that my skin is sensitive to rubbing. I received a sample of Liz Earl Cleanse & Polish hot cloth cleanser. I misplaced the cloth that went with it, but the cleanse seems to be non-irritating and only lightly scented! I do believe it has some ingredients that clog pores, so I’ve only used it twice. Awesome read! Love it, I’m happy to hear the No7 is a good brand!